The Norton Introduction to Literature, Portable Edition, offers an affordable and diverse selection of classic and contemporary literature, the most carefully edited apparatus for analyzing texts and writing thoughtfully, and a wider, more accessible array of student and instructor media. All this, plus a customizable print option, make it a perfect fit for any course. New contemporary selections include works by a compelling group of current writers, such as Junot Díaz, Patricia Lockwood, and Kevin Young—along with newly added favorites by Toni Cade Bambara, Langston Hughes, and August Wilson. A new thematic table of contents—including themes such as "Cross-Cultural Encounters," "Home and Family," and "Love"—groups together diverse stories and poems to engage a single topic from multiple perspectives. Completely revised for the Twelfth Edition, six Writing about Literature chapters offer complete, practical, and accessible coverage of how to write an essay. Included is new and expanded coverage of fundamental topics such as developing a thesis, crafting an argument, citing your sources, and more. All MLA documentation has been updated to reflect the new guidelines in the MLA Handbook, Eighth Edition. The improved and expanded LitWeb site features new Pause & Practice exercises that expand on the Writing about Literature chapters and videos with a variety of assessments. LitWeb also provides an expanded selection of Workshops and reading comprehension quizzes. Coursepacks for every LMS make all the resources of LitWeb easily available and free to students. 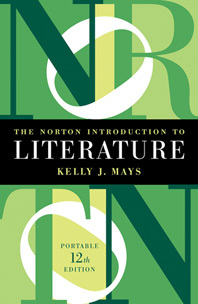 The Norton Introduction to Literature family has a text to fit your course. Choose between the Portable print text and the new Digital Shorter Edition, or create a custom print text with the selections and apparatus you need.